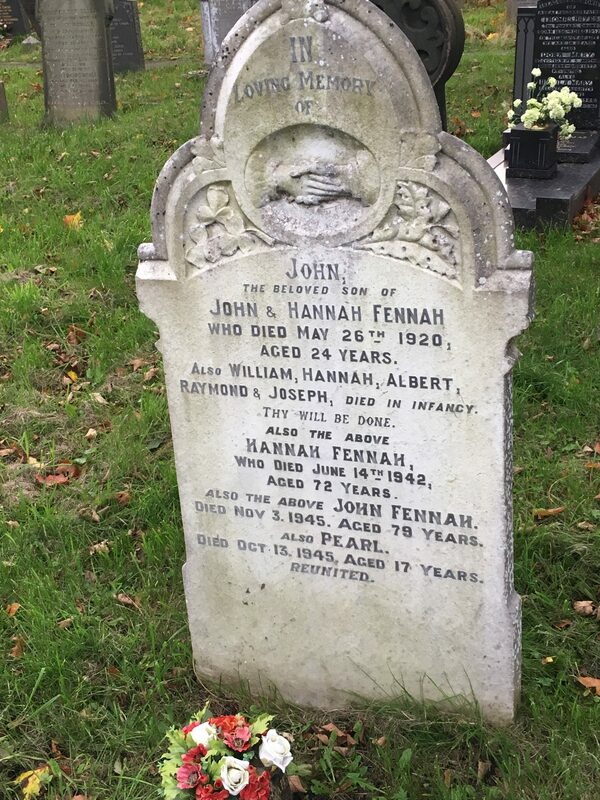 John Fennah was the son of John and Hannah Fennah of Liverpool Road. John was buried at St. Matthew’s, Buckley on 29th May 1920. He was granted a Commonwealth War Graves Commission Memorial showing that he had served in the Machine Gun Corps, but no other military records have been found. John is not named on the Memorial at St. Matthew’s. John Fennah was born 16th July 1895 and baptized at St. Matthew’s 7th August 1895. His parents, John Fennah and Hannah Hughes were married in Chester District in 1891. From the 1911 census John and Hannah had 12 children, 8 of whom survived infancy: Richard, Elizabeth, John, Thomas, Charlotte, Robert Samuel, Mary Martha, and Minnie. In 1911 the family was living at 1 Oak Bank Liverpool Rd. and John, then 16, was a colliery worker like his father. John is remembered on the family grave at St. Matthew’s. From his death certificate we know that John died of tubercular peritonitis at home, 41 Liverpool Road.